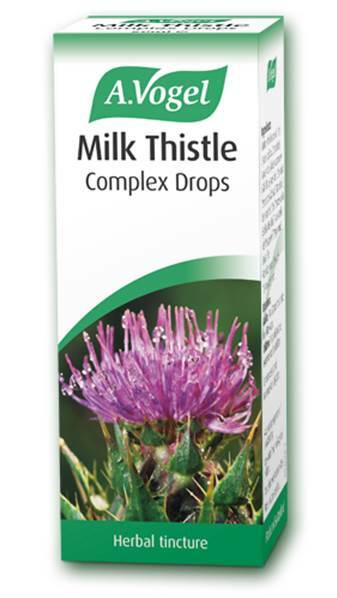 A. Vogel Milk Thistle Complex health supplement is a tincture with liver herbs artichoke, milk thistle, dandelion, boldo & peppermint, which strengthens, cleanses & protects the liver. Also contains microcrystalline cellulose and hydrated cottonseed oil.Each250mg tablet contains the equivalent of 500mg Milk Thistle Complex tincture. *Organically grown.The liver performs many vital functions in the body. It stores vitamins and minerals, produces bile which is required for the breakdown of fat and is the main organ involved in the metabolism of food, drugs and hormones. Liver impairment can produce liver and gall bladder complaints and digestive disturbances. It is now well established that the liver herbs can play an important role in restoring physiological function in these conditions.The combination of Artichoke and Milk Thistle is synergistic, enhancing the efficacy of the preparation. The ability of Artichoke to lower cholesterol levels is of great use therapeutically.It is a condition which is often inherited along with other 'allergic' conditions such as eczema and asthma. These three conditions have been given the term the' Atopic Triad'. Contains the tinctures of fresh Cynara scolymus*(Artichoke) leaves 46%,Silybum marianum (Milk Thistle) dried fruit 32%, fresh Taraxacum officinalis*(Dandelion) herb and root 12%, Peumus boldus (Boldo) dried leaf 7% and fresh Mentha piperita*(Peppermint) leaves 3%. Extract of fresh Cynara scolymus*(Artichoke) leaves46%, Cilium marianum (Milk Thistle) dried fruit 32%, fresh Taraxacum officinalis* (Dandelion) herb and root 12%, Peumus boldus (Boldo) dried leaf 7%, fresh Mentha piperita* (Peppermint) leaves 3%. Children: This product is not recommended for children. Directions: Adults: 1 tablet twice daily Children: This product is not recommended for children.